Hello, I'm 46 years old. I've been in relatively good shape/health all my life with on and off weight training but no serious aerobics. After gaining some weight, I recently started jogging (just up the block and back). It seems ridiculously difficult and I am experiencing what I think is minor shin splint pain. Could I possibly be that out of shape? Also, I'm just using an old pair of Kmart sneakers. Any advice? Running can be quite difficult at first, especially if you have never been involved in any serious cardiovascular / aerobic exercise. I always recommend beginning runners to "ease into running". You can do this by taking walking breaks. 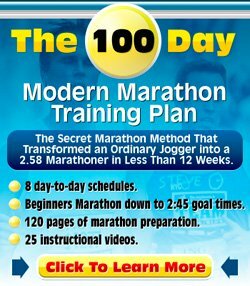 Elsewhere on this site you can find some great beginner running programs. Even if you decide not to use any of those running schedules, you can at least get a feel for how I have structured them and how they slowly build up the mileage and the time spent running. Another important beginner running tip is to make sure you run at easy pace, i.e. the pace at which you can maintain a conversation. Yes, that slow. Follow these two bits of advice and I guarantee you that your running will be a whole lot more enjoyable! Also check out these beginner running tips for more advice. As to the shoes: yes, they may be part of the reason you are feeling the shin pains. When you are running, every time your foot lands, your feet and legs have to endure the impact of 2-3 x your body weight. When you run on old / lower quality running shoes, your risks of all kinds of injuries are higher. So, when you decide that running is for you, I would definitely go to a specialised shoe store and get shoes that are right for your feet. Click here for more advice about how to choose your running shoes. Best of luck with your running. All beginnings are hard. I hope you persevere! Thanks for the advice Dominique. It's almost frustrating to know people older than me that can easily run 10 miles or more with ease but I do realize that it took them probably years to reach that point. I'll find a shoe store that can fit me with something appropriate and start out slow.